Five games or so is really a small sample to figure out how good a team is in an 82-game season. It’s safe to say the Edmonton Oilers (5-1-0) and Vancouver Canucks (4-1-1), who are atop the Pacific Division, are better than expected, but likely for different reasons. The Oilers are so deep with offensive talent they’re playing 2011 No. 1 overall Ryan Nugent-Hopkins as their third line center. Vancouver? Who knows. They were expected to be pretty bad and in a youth rebuild. STAYING HERE — Denis Malgin and Shane Harper. A few people griped a bit when the 19-year-old Swiss forward and the 27-year-old Californian broke camp with the team, but the lesson the pair has taught is this: Let’s give them a chance before we ship them out to Springfield. Malgin was a big unknown coming in. With Lawson Crouse and Rocco Grimaldi out of the picture, more talk centered around Kyle Rau, Juho Lammikko, Jayce Hawryluk and even Dryden Hunt, a curious potential “diamond in the rough” signing, among the forwards who were looking to impress. However, Malgin tore it up in rookie camp and showed he belonged with the big club in the preseason. Much like Tampa’s 20-year-old Brayden Point, Malgin battles size issues as both are a couple of inches short of six feet. Yet what they’re not short of is talent and determination — you know, those immeasurables — that have put both players on teams that most feel should be in the playoffs. Though he hasn’t beaten an NHL goalie yet, Malgin has outworked defenders and won battles that have led to goals, again showing that the staff’s decision to bring him up was the right call. I tweeted Saturday night that Malgin was “clearly the most electrifying player who has never scored a goal,” but I think that changes and I’m going to go ahead and call my shot Babe Ruth-style: Malgin scores against Pittsburgh. Maybe it’s because Malgin sounds like Malkin. Or because Malgin wears No. 62 like the Penguins’ Carl Hagelin, who was instrumental in their Cup run last year. Whatever. I’ll take any off-the-wall connection at all I can use, but it’s time for Malgin to score. The well-traveled Harper nearly made the club out of camp last year, but that honor went to Connor Brickley. Now it’s Harper’s turn, and the former ECHLer is making the most of it. Unlike most from that league, Harper can flat out score — he’s done it everywhere he’s played. His finish from nice assists from Greg McKegg and Alex Petrovic on 2-on-1s Saturday are skillful scores we don’t see often from NHL fourth lines. But again, Harper has scored at all levels, so don’t be surprised when he shoots more often and it happens again. Quite a few players have bounced in and out of Florida’s bottom six in the past year — some have been dealt, some demoted, some just outright handed their walking papers. Malgin and Harper appear to be good candidates to stay here all year, putting pressure on young players to step up their game if they want to get the call and likely keeping Shawn Thornton out of the lineup. The lineup decision gets tougher when Nick Bjugstad returns in the near future and Jonathan Huberdeau in early 2017, too. 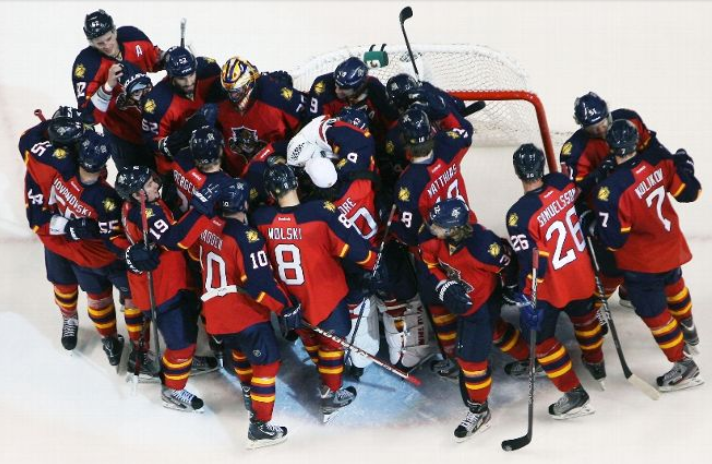 MUST SEE STs — The Florida Panthers’ special teams have always been interesting to watch and often a work in progress. That’s still the case this year. First, the good: The penalty kill has been excellent through five games. The PK is a major asset on a couple of fronts. First, it’s been non-existent much of the time because Florida has shown its discipline by being down a man only 11 times, a 90.9% clip that ranks ninth in the NHL. The power play is a different story — so far. Only twice in 18 opportunities (11.1%) has Florida scored on the PP, which is hard to fathom considering there’s a 750-goal scorer and two of the game’s best young centers on the ice. “So far” is the key here. The PP has only reaped benefits for Jaromir Jagr and Aaron Ekblad, but it has shown signs of life. Look for Reilly Smith, Vincent Trocheck, Jonathan Marchessault and Keith Yandle to start tallying goals with the man-advantage. Florida ices too much offensive talent to sit tied for 23rd in the PP. Both special teams must improve into the top half of the NHL in order to have long-term success and make a deep run. A TOUGH ONE — Like most, you probably feel the Cats gave away a point in the final seconds in Tampa in a game they deserved to win last week. In actuality it’s a three-point swing: the one Florida didn’t get for the win and the two the Bolts got instead of a regulation loss. Making it worse is that the points transfer happened with a divisional opponent. And if Montreal stays hot and is for real and Florida and Tampa Bay fight but come up in second and third in the Atlantic, those three points could determine home-ice advantage in a Citrus Showdown in the first round of the Stanley Cup playoffs. But it’s a long season, one in which Florida will surely come out victorious in a game or two when they shouldn’t have. It’s a tough, tough season, too. Look at Trocheck’s face in the season’s first week. A pair of scabbed over wounds on each cheek, the Pittsburgh native wears black and blue instead of black and gold right now.But Trocheck won battles, scored a greasy goal and lobbied for a high-sticking call Saturday night after one of the abrasions was re-opened and bubbled blood. Trocheck’s counenance is a canvas showing the determination and grind that comes with a grueling NHL campaign, with scabs, scratches and scar tissue the paint that splatters the canvas. Meanwhile, bruises, muscle pulls, dental issues and lingering body pain will define the days. And it’s not even Halloween yet. SUNRISE — The 2016-17 season hasn’t even started yet for the Florida Panthers, yet I feel like the Cats are already struggling to hang on somewhat. The major injury to Jonathan Huberdeau (out 3-4 months) and the minor one to Nick Bjugstad (out a month) have given the club its fair share of bad news and we haven’t even dropped the puck yet. The setbacks have some of the prognosticators frowning on the new-look Panthers — both in their attire and the players on the ice — but the pundits were going to choose Tampa Bay to regain the Atlantic Division, regardless of coach Gerard Gallant and his staff being without Bjugstad and Huberdeau. Good teams rally in times of crisis, though, and this group of Cats should be up to the task of solidly securing a playoff berth. To do that, their primary scorers must do their jobs plus have secondary scoring and improve the power play. BREAKOUT PLAYER: Jonathan Marchessault. If you looked at Tampa’s roster and its crop of UFAs and RFAs on July 1, the two names that jumped off the screen at you were Steven Stamkos and Nikita Kucherov. Most had Stammer pegged for Toronto while Kucherov couldn’t hammer a deal. Florida never had a shot at 91, though I’m confounded as to why the Panthers didn’t offer-sheet Kucherov, the 23-year-old Russian right winger who is a deadly sniper. Let’s face it, the Cats will need a top RW shortly, and six years or so of Huberdeau-Barkov-Kucherov is enough to make you salivate. But the third name on that list — and the most obtainable one — was Marchessault, who was looking for minutes and a better opportunity with his minutes limited on Florida’s west coast. A huge favorite of the Bolts and coach Jon Cooper, Marchessault should have the breakout year this season that some have predicted. In Lightning games I watched, he and teammate Vladislav Namestnikov were always a problem for the opposition, using their speed and skill to create scoring chances where none seemed to exist. That kind of production is why he’s on the top line now at left wing in place of Huberdeau. I expect him to get time on the power play, exceed expectations and be the acquisition I thought he would. In Season 3 of The Walking Dead, the Governor reunites Merle and Daryl, unveiling the latter to the former, saying to Merle, “You wanted your brother, now you got him.” Well, Marchy wanted more minutes. MUST-DO-WELL PLAYER: James Reimer. With starter Roberto Luongo coming off hip surgery, Reimer will play an enormous role in spelling Florida’s 37-year-old starting netminder. The choice of Reimer was a solid one. Jhonas Enroth was another possibility, but the 28-year-old Reimer was signed to a 5-year/$17 million contract and will have plenty of chances to get starts here and there and show what he can do. Like Marchessault, a great opportunity exists for him with the Cats. O CAPTAIN! MY CAPTAIN: Derek MacKenzie. From the start, I thought D-Mac displayed the traits necessary — most notably his leadership qualities — to earn the C on his new Florida sweater. Did he play enough to warrant it? The top six definitely plays more. Is he high-profile enough? Luongo, Jagr, Barkov and Ekblad are the familiar faces. Does he score enough? He was tied for 11th with Kulikov in team points with 17. All of those questions could start with “No” as an answer, but MacKenzie brings more to each 60 minutes than just stats. He’s a tireless worker, excellent penalty killer, gritty as my wife’s homemade soaps and shows the leadership every player in the room looks up to. Hey, Jagr said it was an easy, perfect choice. That’s good enough for me. THE SEASON: 43-28-10 (96 points). The early injury bug will be important for Florida to overcome. Don’t expect a 12-game winning streak, but an offensive improvement on the blue line should create more goals, and newcomer Keith Yandle should be a force quarterbacking the power play. Tampa will win the Atlantic while Florida will finish second, then host Montreal in the first round of the Stanley Cup playoffs, where Quebec native Luongo will shut down the Habs and send Florida to the second round.